Discover your options for treating Kidney tumors with CyberKnife. At Pasadena CyberKnife, we provide the most advanced stereotactic radiosurgery treatments to patients all across the greater Pasadena, CA area. If your oncologist has recently diagnosed you with kidney cancer, our targeted radiation therapy might be one of the best treatment options available to you! Our state-of-the-art CyberKnife system delivers precise doses of radiation with incredible accuracy, making it the perfect choice for kidney cancer patients both young and old. If you’ve explored other options — such as surgery — and they’re just not right for you, our Los Angeles CyberKnife treatment center provides a non-invasive alternative. Your kidneys are a pair of bean-shaped organs, each about the size of a fist. They are attached to the upper back wall of the abdomen and protected by the lower rib cage. One kidney is just to the left and the other just to the right of the backbone. The kidneys’ main job is to filter the blood coming in from the renal arteries to remove excess water, salt, and waste products. Kidney cancer is a cancer that starts in the kidneys, causing both small and large tumors to grow. Cancer starts when cells in the body begin to grow out of control. Cells in nearly any part of the body can become cancerous, and can spread to other areas. 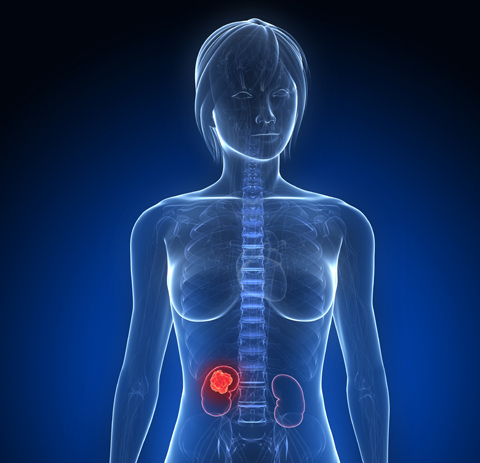 Early kidney cancers do not usually cause any signs or symptoms, but larger ones might. These signs and symptoms can be caused by kidney cancer (or another type of cancer), but more often they are caused by other benign diseases. For example, blood in the urine is most often caused by a bladder or urinary tract infection or a kidney stone. Regardless, if you haven’t been diagnosed with kidney cancer and you have any of these symptoms, see a doctor immediately so that the cause can be found and treated, if needed. Unlike kidney cancer treatments of the past, our CyberKnife system has the ability to compensate for movement when treating your cancer, precisely targeting the tumor(s) during the entire procedure and minimizing damage to surrounding healthy tissue. This feature of our technology is critically important when treating kidney tumors, which can slightly shift during your procedure due to regular patient movements, such as breathing. Your kidney is located near your bowel and your lungs, where there is constant movement due to natural bodily functions, such as breathing and the passing of gas. Treating this area with radiation poses serious challenges for oncologists, as older cancer treatment technologies require stabilizing devices combined with breath-holding techniques and gating. At Pasadena CyberKnife, our CyberKnife system delivers a high dose of radiation directly to the cancerous tissue with pinpoint precision. Unlike conventional radiation therapy treatments, the CyberKnife system is designed to respond to the movement of the tumor as a result of respiration or other involuntary bodily functions. During treatment, the Pasadena CyberKnife system continually calibrates your tumor’s position through a unique combination of real-time imaging and intelligent tumor tracking – remaining on target throughout treatment. Each CyberKnife treatment session at our Pasadena cancer center takes between 30 and 90 minutes to complete. Treatments are completed in one to five sessions, usually in the course of just one week. That’s a vast improvement over the 25 to 47 sessions patients need with conventional radiation therapy! Get In Touch With Pasadena CyberKnife Today! Regardless if you’ve just been diagnosed with kidney cancer, or you’ve been in treatment for a long time, Pasadena CyberKnife is an effective alternative to traditional kidney cancer treatments! With state-of-the-art CyberKnife technology, our team in Pasadena, CA can provide you pinpoint radiation targeting that keep your surrounding tissues as healthy as possible. For more information on our CyberKnife system, don’t hesitate to get in touch with us today! For more information on CyberKnife’s ability to treat Kidney Tumors, check out our Case Studies.